The new Infiniti Q30 Diesel Hatchback is uniquely styled, safe and economical. It’s the somewhat left-field choice in the compact luxury market, but it’s far from the worst choice. In fact, it even shares a lot of its structural components with the Mercedes A-Class. However, what it doesn’t have is that car’s badge appeal – and this could be the deal breaker for some buyers. Infiniti is a relatively young brand. Set up as the luxury arm of Japanese manufacturer Nissan, the marque has been around since 1989. Find out how they went from a soft launch to selling in over 50 countries in our brief history of Infiniti. OSV takes a closer look at what it’s all about with our 2018 Infiniti Q30 Diesel Hatchback review. Infiniti have very much put the focus on comfort here, and as such the Q30 can rival a Mercedes when it comes to pure relaxation. On the other hand, it can’t match a BMW for out and out driver engagement. Indeed, its smallest engines feel a bit underpowered and need to be worked hard to get the best out of them, and this goes against what the car is all about. Handling-wise, the Q30 is fairly unremarkable. 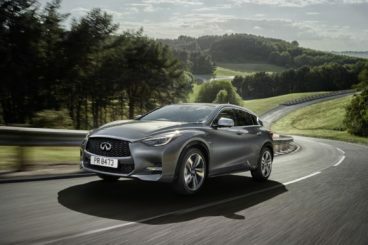 The Q30 is the sportiest model in the range, and it can get you from rest to 62mph in just 7.2 seconds, but it doesn’t seem worth its high listing price. All models offer lots of grip, with four-wheel-drive models offering even more, but no Q30 feels as agile as its closest rivals. In terms of its engines, the 1.5-litre diesel is our top pick. It develops 260Nm of torque and 108bhp and has a 0-62 time of 12.0 seconds. It’s frugal, refined and smooth and it works very well with the accurate 6-speed manual gearbox. That said, it’s a gearbox that will take some getting used to, as it has a tendency to feel a bit fiddly as you flick between forward and reverse gears. Alternatively, you can pair the engine up with a 7-speed automatic transmission. There’s also a 2.2-litre diesel engine available, but it isn’t as impressive. It’s a dated Mercedes engine that will be replaced soon. It’s loud, unrefined and hard to recommend, despite a 0-62 time of 8.3 seconds. Other than that, it’s also worth mentioning that you can pick from two different chassis: A Sport chassis or a Premium Chassis. We highly recommend the latter, as the former stiffens the suspension and primes the car for a sportier setup – which isn’t what this car is all about. This might not have the same badge appeal that a Mercedes has, but there’s nothing to complain about where its cabin is concerned. There’s a lot of quality here and at times it feels genuinely luxurious. 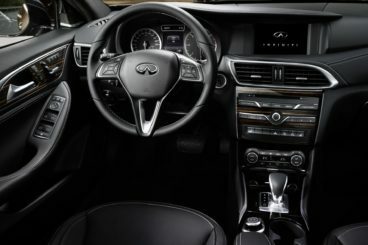 This is aided by the fact that Infiniti have put so much focus on making the car as comfortable as possible. It smooths out most road surfaces and insulation is excellent – and this is despite the fact that the car comes with 18” wheels as standard. Of course, insulation will be less than impressive if you opt for the noisy old 2.1-litre diesel engine. Design-wise, the Q30’s cabin looks good, and it’s clear that the brand have partnered up with Mercedes. We like the suede-effect roof lining, the switchgear feels nice and solid, and overall this is an upmarket cabin that holds its own against its rivals. That said, there are one or two harder plastics here and there of the kind that you wouldn’t find in a Mercedes. Is the Infiniti Q30 Diesel Hatchback practical? It makes a good case for itself as a family hatchback. It’s not as big as a VW Golf, and headroom is a bit cramped in the front and the rear, but overall interior space is acceptable. Its boot, meanwhile, measures 430-litres which makes it by far one of the biggest in this class. Is the Infiniti Q30 reliable? Find out more about Infiniti’s reliability by reading our honest assessment of the brand. Standard kit is good across the range, with the entry-level Pure model getting 18” alloys, rear parking sensors, automatic headlights, Bluetooth and air conditioning. The Luxe model adds automatic wipers, heated seats, cruise control, climate control and “In Touch” navigation. The Sport trim rounds things off with stiffer sports suspension, 19” alloys and a restyled grille and bumper. In terms of how safe the car is, Euro NCAP awarded it all five stars for its crash test performance. It scored highly for pedestrian, child and adult occupant protection. Its standard safety kit includes active cruise control, auto dimming headlights, emergency braking, forward collision warning, blind spot warning and parking assistance. Lane departure assistance isn’t available with the entry-level model. Prices for the new car start out from £20,600 and rise to £36,435. For more information on our leasing deals, you can check out our page here. In terms of its running costs, the 1.5-litre 108bhp turbo diesel engine is able to return as much as 72.4mpg on a good day and emits just 103g/km of CO2. That qualifies it for a BiK rating of 22%. All these numbers are impressive but the engine isn’t the most powerful (or the quietest) around and therefore isn’t easy to recommend. Moreover, in the real world, you might find that the best you return is 47mpg economy. The bigger 2.2-litre 168bhp diesel offers more grunt and still emits just 115g/km of CO2 if you stick to the two-wheel-drive variant. Specifying four-wheel-drive changes that figure to 127g/km. The Q30’s upmarket cabin can hold its own against its rivals. It stands out from the crowd with distinctive looks. Infiniti’s official economy figures will be hard to reach, but even if you average around 50mpg, that’s still very good for a car of this type. The smaller diesel is on the slow side, and while the bigger 2.2-litre engine takes things up a notch, it’s old and loud. Headroom isn’t great back there. Let’s see how the car fares against its rivals in the comparison section of our 2018 Infiniti Q30 Diesel Hatchback review. 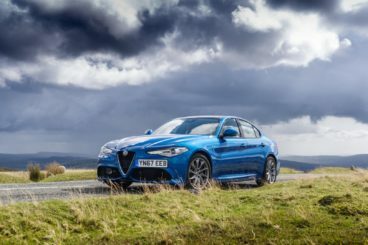 The new Alfa Romeo Giulia Diesel Saloon is a luxurious and stylish Saloon car that – like the Infiniti – is an alternative to the premium German exec cars. On the road, it’s great to drive and can offer a more engaging experience than the Q30. That said, it’s just as comfortable as it is performative. Its handling prowess is helped by the fact that it’s a rear-wheel-drive car, with enthusiasts often preferring this because it offers a purer driving experience. As a result, there’s a lot of fun to be had behind the wheel of this Alfa Romeo. Moreover, because it’s made extensively from aluminium, it’s light and agile. In terms of its engines, there’s only one diesel available. This is a 2.2-litre unit that develops either 148 or 178bhp. We prefer the latter for its extra power. It covers the 0-62 dash in just 7.1 seconds and yet is still remarkably economical. The 148bhp variant is hardly a slouch, though, and has a 0-62 time of 8.2 seconds. Running costs? The smaller diesel is good for returns of 67mpg on a good day, while the bigger 178bhp diesel can manage the exact same. These are very good numbers, and both engines emit just 109g/km of CO2, which qualifies them for a BiK rating of 23%. Inside, the Alfa Romeo is a lot like the Infiniti; it’s plush and at times luxurious. All models get a 6.5” display that’s angled towards the driver, and all the controls and dials are logically arranged for ease of use. The dashboard is modern and tastefully designed, and it’s also free from button clutter. Is the Alfa Romeo Giulia Diesel Saloon practical? Its boot measures an impressive 480-litres and comes with a useful wide opening. The load lip, however, is a bit high but this is the case in most cars of this type. Other than that, the car can boast the longest wheelbase in this market, which means interior space is good. Four adults can sit in comfort on longer journeys, and leg and headroom is good for all – except a fifth passenger who’s sat in the middle. They will have to make do with a pronounced hump in the floor. The new BMW 3 Series Gran Turismo Diesel Hatchback is a premium family car that’s comfortable, performative – and just about everything you expect a BMW to be. On the road, it’s excellent and drives a lot like the smaller 3 Series Saloon. That’s a sterling effort from the BMW engineers when you consider the differences in size. Of course, there’s more body lean here and this GT variant is heavier, but direct steering and a pliant suspension setup are major pros. In terms of its engines, the 318d GT diesel has a 0-62 time of 9.3 seconds and is the slowest model in the range. The 320d GT is faster and can gallop from a standstill to 62mph in 7.8 seconds, but the 330d GT model slashes that to 5.7 seconds. All these models come with either two or four-wheel-drive – it’s up to you. The 335dGT model, however, is four-wheel-drive only and has a 0-62 time of 4.9 seconds. Running costs? The 320d GT diesel is the most popular, and returns of 56.5mpg economy are a big part of its appeal. It also emits 130g/km of CO2. However, if you specify four-wheel-drive, those numbers do get worse, but not glaringly so. The 330d GT and 335d GT models, meanwhile, offer the last word in performance, but despite their extravagant speeds, they can still return as much as 45mpg economy on a good day. That really isn’t bad when you consider that the 335d model comes with four-wheel drive as standard. Inside, BMW have somehow managed to make this GT version even comfier than the standard saloon. To get as much comfort out of it as possible, though, you’ll need to avoid the 19” alloys. Adaptive dampers, meanwhile, are available as an optional extra. There is also more of a luxurious feel in here than in the standard saloon, and this is mostly due to the fact that the GT is more vast. Its dashboard is the same one that you’ll find in the saloon model, and it comes with BMW’s trademark upmarket finishes and top-notch plastics. 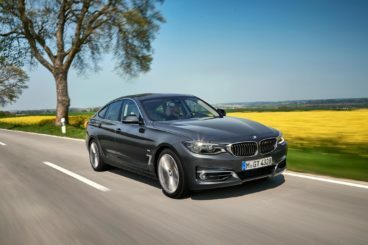 Is the BMW 3 Series Gran Turismo Diesel Hatchback practical? Its boot measures an impressive 520-litres and comes with a massive power-operated boot lid for ease of use. Fold the rear seats and you can extend boot space to 1,600-litres. Other than that, there’s a lot of space inside here. Legroom is good, the raised seats make it accessible, and the rear seats recline and are wide enough to sit three adults in relative comfort. Storage solutions, meanwhile, mimic the saloon version and include some reasonably sized door bins and a big glovebox. If you like being different but still want to be classy, this is a good premium alternative to the usual premium suspects in this class. It’s not going to be to all tastes, but it’s plush, stylish, modern and clean. The new Infiniti Q30 Diesel Hatchback isn’t cheap but it’s hard to think of a better upmarket family car for those who want to stand out from the crowd.